Engraved plaque containing Apostle Paul's sermon, at the Areopagus, Athens, Greece. The Areopagus sermon refers to a sermon delivered by Apostle Paul in Athens, at the Areopagus, and recounted in Acts 17:16–34. The Areopagus sermon is the most dramatic and fullest reported speech of the missionary career of Saint Paul and followed a shorter address in Lystra recorded in Acts 14:15-17.
his soul was troubled and his heart was grieved, …he was exasperated and provoked to the last degree: he was in a paroxysm; his heart was hot within him; he had a burning fire in his bones, and was weary with forbearing, and could not stay; his zeal wanted vent, and he gave it. 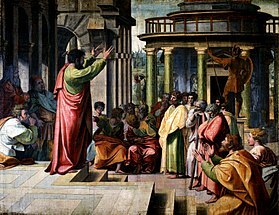 So Paul went to the synagogue and the Agora (Greek: εν τη αγορα, marketplace) on a number of occasions ('daily'), to preach about the Resurrection of Jesus. Some Greeks then took him to a meeting at the Areopagus, the high court in Athens, to explain himself. The Areopagus literally meant the rock of Ares in the city and was a center of temples, cultural facilities, and a high court. It is conjectured by Robert Paul Seesengood that it may have been illegal to preach a foreign deity in Athens, which would have thereby made Paul's sermon a combination of a "guest lecture" and a trial. This sermon illustrates the beginnings of the attempts to explain the nature of Christ and an early step on the path that led to the development of Christology. "As I walked around and looked carefully at your objects of worship, I even found an altar with this inscription: TO AN UNKNOWN GOD. So you are ignorant of the very thing you worship — and this is what I am going to proclaim to you." Paul then explained concepts such as the resurrection of the dead and salvation, in effect a prelude to the future discussions of Christology. After the sermon a number of people became followers of Paul. These included a woman named Damaris, and Dionysius, a member of the Areopagus (not to be confused with Pseudo-Dionysius the Areopagite or Dionysius, the first Bishop of Paris). In the 20th century, Pope John Paul II likened the modern media to the New Areopagus, where Christian ideas needed to be explained and defended anew, against disbelief and the idols of gold and silver. ^ a b McGrath, Alister E. (2006), Christianity: an introduction, pp. 137–41, ISBN 1-4051-0901-7 . ^ Schnelle, Udo (Nov 1, 2009), Theology of the New Testament, p. 477, ISBN 0-80103604-6 . ^ a b Mills, Watson E. (2003), Mercer Commentary on the New Testament, pp. 1109–10, ISBN 0-86554-864-1 . ^ Gill, John. "Gill's Exposition of the Entire Bible". Bible hub. Retrieved 28 September 2015. ^ Miller, Vincent J. (2005). Consuming religion: Christian faith and practice in a consumer culture. p. 99. ISBN 0-8264-1749-3. This page was last edited on 10 March 2019, at 18:46 (UTC).